I was delighted to facilitate a session at Mozilla Festival 2015 over the weekend. Last year I attended my first MozFest as a participant, so this was my first experience facilitating, along with my Hack Aye co-founder Jen Hunter. In the spirit of openness I’d like to use this post to figure out and document what I learned at MozFest 2015. This year I felt I got a lot more out of MozFest than last time. It’s a chaotic, messy, creative, overwhelming experience, the quality of which depends massively on your perspective going in. Last year I spent most of the Saturday staggering around slightly dazed by the whole spectacle, only getting into the swing of things sometime on the Sunday. 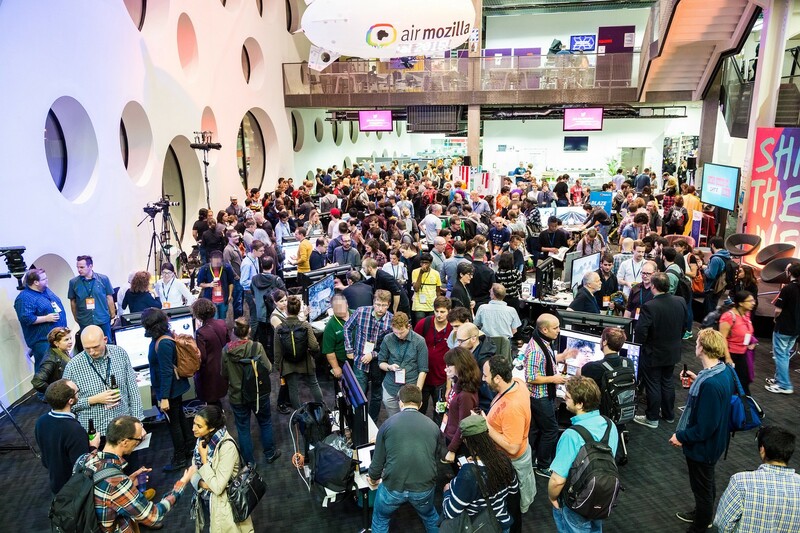 My advice for anyone attending their first MozFest in future would be — pick your sessions then get fully immersed in each one (try and forget about the seven other sessions you thought about that are happening at the same time). 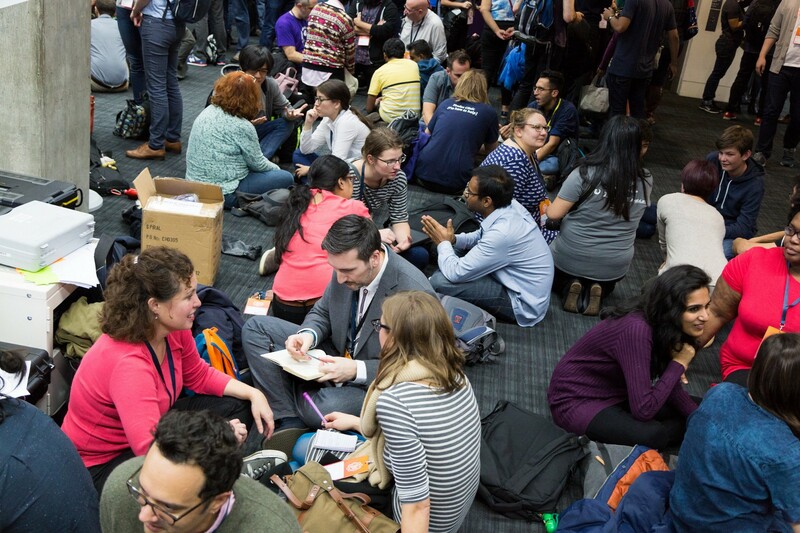 Being a facilitator changed my MozFest perspective in a really productive way. I felt more fully engaged in the sessions I attended this year, mindful that the success of a learning experience is dependent on participants and facilitators alike. At our session we started the process of developing a collaborative framework for planning activist campaigns using GitHub — you are more than welcome to contribute to or fork it! Hopefully this will be one of the many projects started at MozFest that continues to grow after it. In my “job job” I’m a tech and copy writer. Over the past couple of years I’ve worked on Mozilla projects including Open Badges and Hive Learning Networks. Through this work I’ve learned about — and been hugely influenced by — the theory of peer learning, which we try to observe with Hack Aye. Attending MozFest was an opportunity to see expert practitioners facilitating learning experiences in which everyone is both a teacher and a learner. I have to admit the idea of leadership is one I’m intuitively uncomfortable with—I associate it with an inherent sense of inequality. However, I’ve had to question that assumption both through my work with Hive and my experience at MozFest. In particular, the sessions I attended in the Mozilla Learning Network space gave me a glimpse of the type of leadership that can empower others. Again and again I saw participants looking for ways to connect others to opportunity — if that’s leadership then count me in. We encourage people from non-technical backgrounds to use tech tools such as Etherpad and GitHub to plan arts and activist projects. During the Tech Strategies for Grassroots Advocacy session I realised I’ve been focusing on helping people learn to use the tools, rather than considering the possibility of creating new tools (or interfaces to existing tools) that are better suited to “non-technical” users. One of the main barriers to using these tools is the tech language — but as I discovered during the Getting Down With GitHub session, there’s another (possibly bigger) barrier hiding behind it. Much of that language is tied to software-specific concepts that might not be translatable outside the tech context. When I explain the idea of using open source models in non-tech areas I’m (understandably) often met with either blank or incredulous faces. Being part of the Digital Citizenship pathway at MozFest threw us in with several other facilitators and attendees who also see these possibilities. It’s worth coming into the same physical space for that reassuring feeling that you’re part of a wider movement of people spreading open culture into new places. A common risk in activist projects came up during the Serving Social Change session — telling people what their problem is instead of asking them. Many traditional activist organisations make this mistake and it’s compounded by the hierarchical structures that they work within. However, thanks largely to the Web, we are witnessing a new age of activist movements that are open and decentralised, with issues defined by the people they affect. I’d like to finish by thanking everyone who contributed to our MozFest journey and to ponder a question I’ve considered vaguely in the past but managed to articulate a bit more clearly at the weekend. Contributing to the software using (intermediate/advanced) development skills you already have. Learning basic development skills using tools like Thimble and Webmaker. I wonder if these two pathways could be connected in some way — could contributing to the software be supported as part of a more comprehensive learning pathway? Wouldn’t that be an opportunity to build new layers into the learning experience as well as securing contributions from a wider section of the community? Thoughts on any of the above welcome! I write code and words. Tech writer, worked w/ @mozilla + @tutsplus among others. @HackAye co-founder.